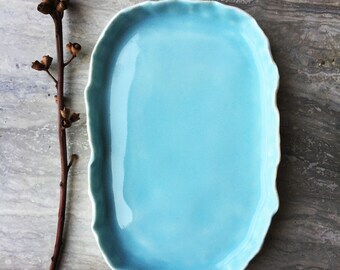 This sweet little plate was hand built by me from fine Australian lumina porcelain clay. It is perfect for serving food on, or simply as decorative art object. After forming and drying the plate by hand, it is bisque fired. 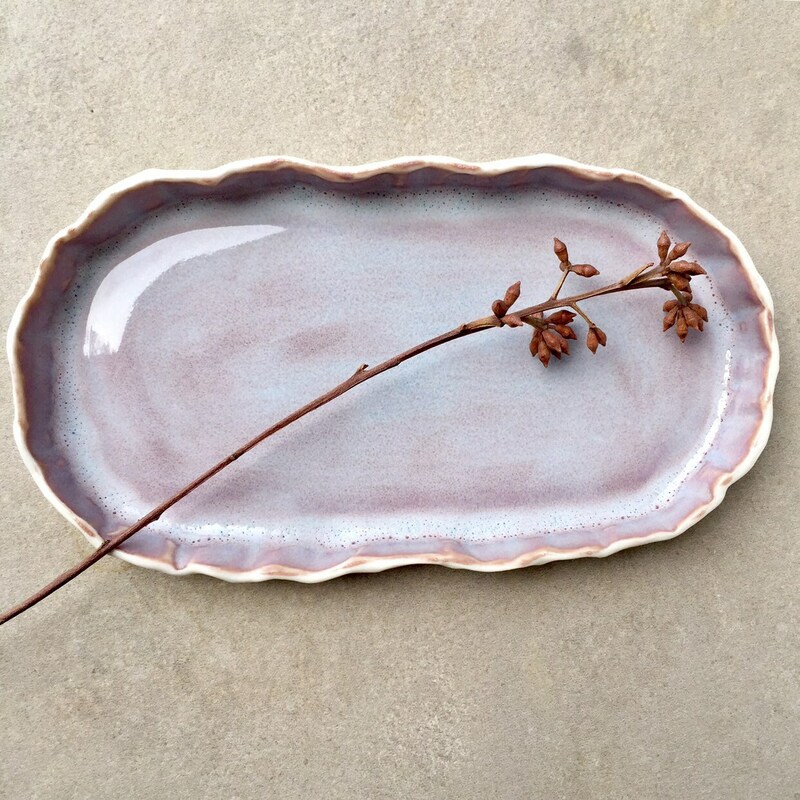 The plate is then glazed with a glossy lilac glaze and refired at high temperature, giving the porcelain strength and durability. The plate is 19cm long, 1.5cm deep, and 10.5cm at the widest point. Many of my ceramic pieces have slight imperfections and irregularities that show they are crafted by hand. This adds to their uniqueness, all items are one-of-a-kind. Love this platter- totally worth the international shipping! It was just what I wanted. I accept paypal and all major credit cards, including payment via direct checkout. All efforts are made to accurately describe and document each piece, but they are all completely handmade, and therefore have variations in colour and shape. If you are unhappy with your purchase and your item is not as you expected, please contact me immediately and I will do my best to amend the situation. If you are still unhappy, you may return the unused, undamaged item within 7 days of receipt, and I will refund the purchase price. I will not be able to refund shipping costs. In the unlikely event of a piece being damaged in transit, please take a photo of the damaged item and box and contact me immediately. I am happy to replace any items that have been damaged due to shipping as long as you contact me as soon as you receive the item. Ready made items ship 1-3 working days via Australia Post. Please check your order for shipping dates on made-to-order items. For international buyers, please allow 3 weeks for delivery, however most parcels arrive within 10 business days. As the buyer, you are responsible for any customs tax that you may incur upon delivery to your country. Shipping costs are an estimate only and include the cost of packing materials. If the actual cost of shipping is lower than the amount paid, I will refund the difference. If actual shipping costs are significantly higher than the estimate, I reserve the right to request additional shipping costs. In this instance, the customer can request the order to be cancelled.